This small dish imitates silver decorated with inscriptions in a black inlay called niello. Here the potter has covered the earthenware body with slip (liquid clay) to create a white ground. The inscription in Arabic was written in contrasting black slip. As on many Islamic dishes, the inscription offers good wishes for the owner. 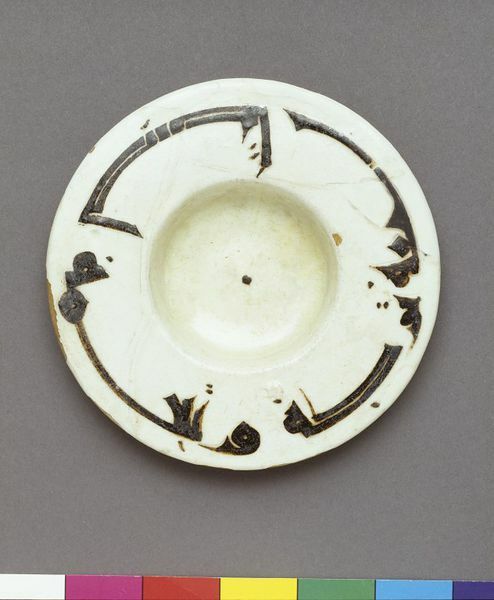 This dish is an example of a distinctive ceramic tradition that developed in eastern Iran from the 10th century. Potters there took inspiration from indigenous metalwork and applied slip of contrasting colours to create the decoration. Lead-glazed earthenware with slip inscription, "Blessing and ease to the owner". 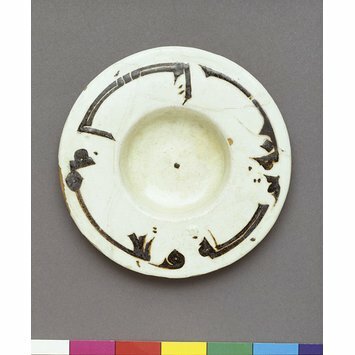 Small earthenware dish with inscription in black slip, Eastern Iran or Uzbekistan, 900-1000. The text on the small dish was carefully executed in thick, black slip. It offers good wishes for the owner. The spiky inscription on the large dish probably has a similar meaning, but it is more ornament than text. The decoration on the inner walls of the bowl is also based on an inscription, but it has been turned into a purely decorative design. As on many Islamic dishes, the words offer good wishes for the owner. Pottery of this type imitates silver inlaid with black inscriptions in niello. The earthenware body was covered with slip to create a white ground, on which words were written in black slip. "Blessing and ease to the owner"
EAST PERSIAN (probably Nishapur) ; 9th -10th century.